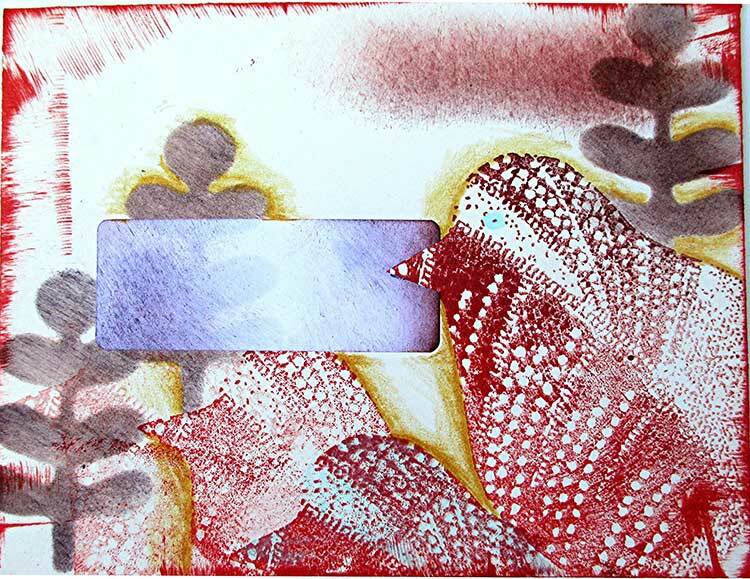 The project title, Flock of Birds, reflects the fact that I stamped a LOT of envelopes. Two dozen, to be exact, though I’m showing only nine of them here. I’ve always worked ‘By the Batch’ method. In fact, that was the title of the last book I wrote*. 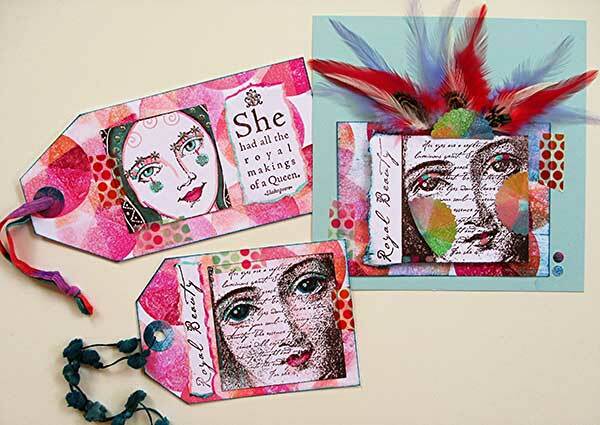 I picked a versatile stamp and stencil set by Nathalie Kalbach (available at The Queen’s Ink, of course, in-store or via mail order). 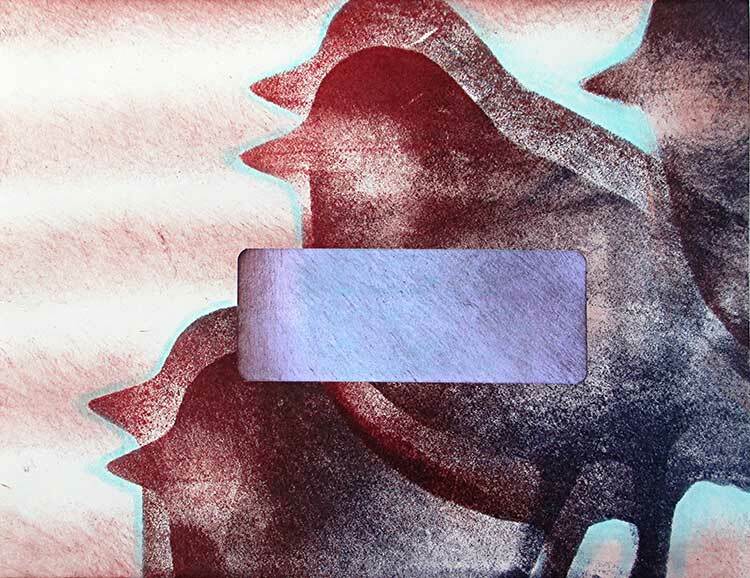 It has a foam stamp with two sides (detailed and a solid silhouette), a cling-mounted rubber stamp, and a stencil with masking pieces. My theory is this: If I’m getting out supplies and making a mess I want to have a bountiful outcome. Kind of like baking a double batch of cookies instead of a half-batch…plenty for later! Throughout these instructions, I’m adding ‘Design Strategies’ (in italic font) – tips that explain not only HOW I did something, but WHY. Yes, it means more words to read, but I hope you find them useful! 1. 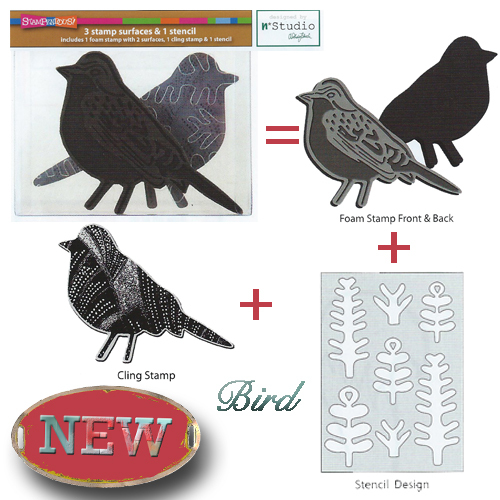 Stamp a batch of A2 (or other) size envelopes using the three bird stamps from the set (two foam stamps, one rubber stamp). 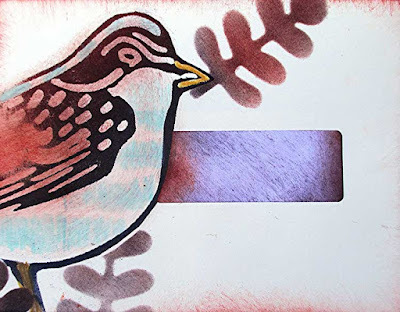 Use the stencil and sponged-on ink to add plants, or position stenciled branches in the bird’s beak. Refer to the photos for placement, taking care to position the bird(s) off to one side to leave room for a mailing label. Use a single bird, or several. 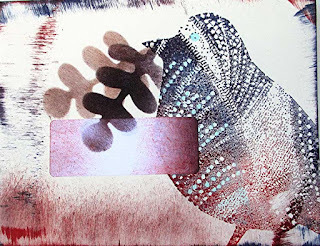 Design Strategy: I used a large size homemade rainbow inkpad so the colors vary within each bird. If you don’t have a multi-color pad, solid colors work fine! I used only one bird stamp per envelope, but you can combine them so you have birds peeking in from both sides of the envelope. This works great with long #10 business envelopes. 2. 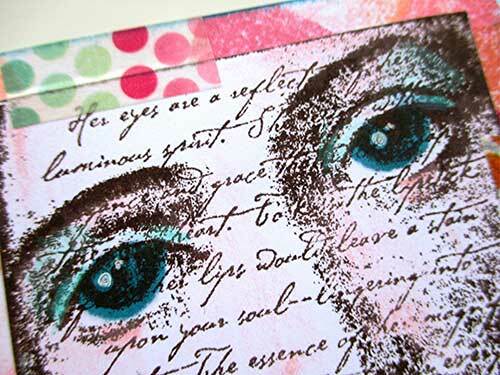 Smudge and smear ink onto and around the stamped images. Also, lightly smudge inks onto some mailing labels. Set labels aside till step 4. Design Strategy: Stamp and cut out masks of the birds if you want to keep crisp edges. 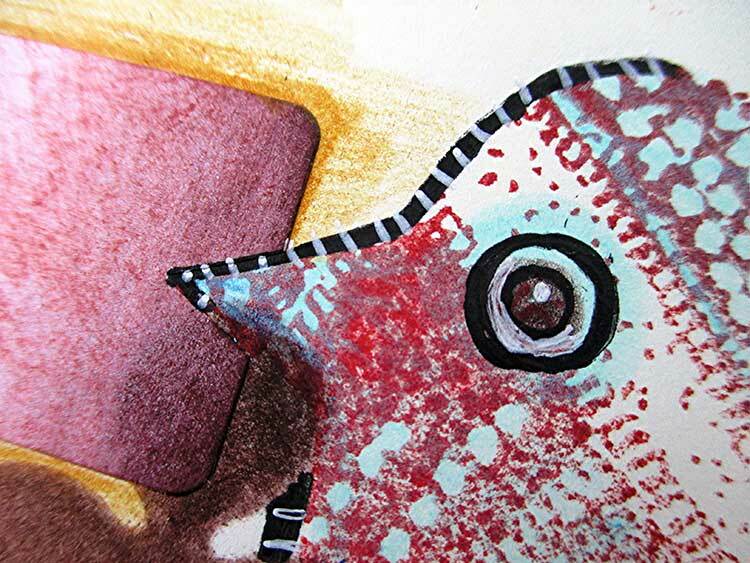 Use a sponge and skip the masking if you are going for a more random look with the colors. 3. Get out the colored pencils, a white opaque ink pen, and a couple of fine line black pens and add more color and detail. Refer to the photos to give you some ideas. Design Strategy: Stick with only a couple of colored pencils if you want your envelopes to resemble mine. Customize to suit your own eye – More colors, markers (but skip the paints – wet media will cause envelopes to ripple). 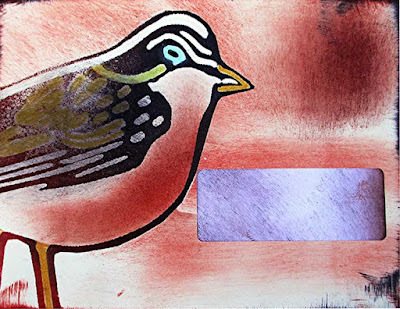 As shown in several of the photos, especially the two below, you can add an eye to the bird even though there isn’t one on the stamp. 4. Add a mailing label to each envelope. The post office will thank you! 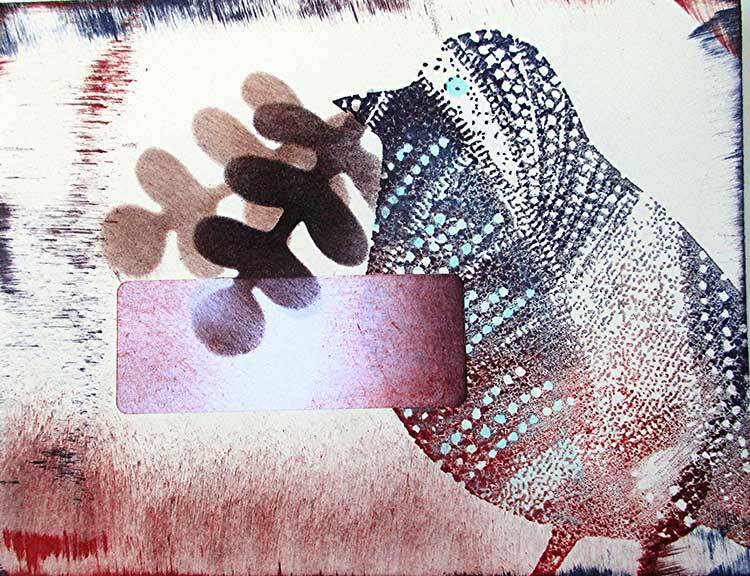 Stamp the beak or a portion of the bird’s body onto a label and ‘fussy-cut’ it so that the bird will appear to look like it’s in front of the label, or holding it in its beak. 5. Smudge extra ink at the upper right if you want to highlight the spot for the postage stamp. Design Strategy: If you know what stamps you’re going to use you can plan the smudged area so it is just slightly larger than the stamp! Thank you so much for inviting me to be part of The Queen’s Ink blog! 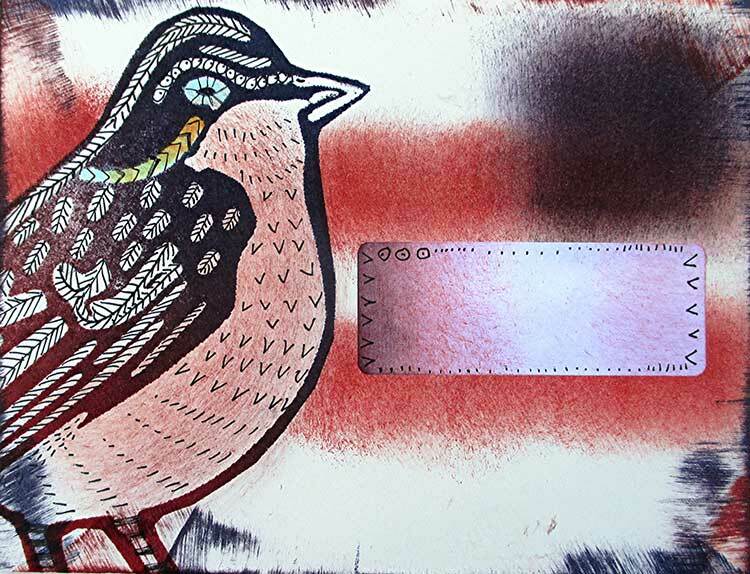 For this, my first post, I thought it only fitting that I feature stamps that Patti Euler designed. I chose NB-034I, NB-031H, and SC-015D -- one stamp with text running up the side and across the face (Royal Beauty), one with no text (just the lovely face), and one that is text-only (a Shakespeare quote). The key to the quick and easy card and tags is a limited palette: Predominantly espresso, teal, red, and shades of pink. 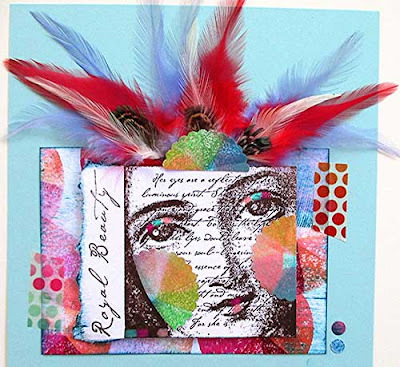 Scroll through the photos and head for your stamps, inks, and colored pencils to create your own version of the card or tags. I stamped an allover pattern on cardstock for the background, but designer papers are another option. I hope you’ll find the instructions thorough and easy to follow. I have included little detours I call ‘Design Strategies’ to explain the WHY of the projects along with the HOW. 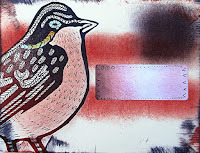 Using Espresso or any dark color ink (Eggplant, Sepia, Navy) stamp images onto uncoated white cardstock. Leave an inch or two between the images for easy cutting and tearing. *Design Strategy: I rarely stamp in black or use black embossing powder. Other colors feel richer, more lively, unexpected, and more interesting to the eye. Cut out the stamped rectangles, with or without the attached words that are part of the stamp. Tear around the edges of the words to create separate elements, as shown, or if you prefer smooth edges use a craft knife and straight edge for all cutting. Color with pencils and markers as shown or as you prefer. *Design Strategies: No need to be realistic! I used a bright teal marker to intentionally color outside the pupil on the eyes for one of the tags (it makes the Queen look so pretty, don’t you think?). 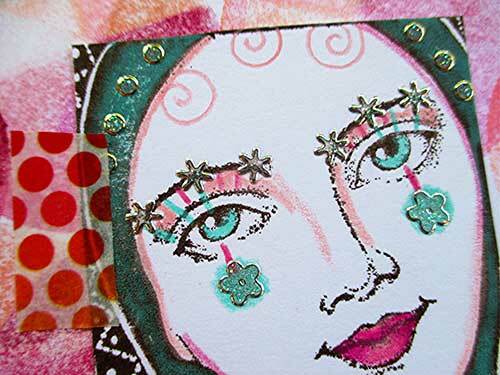 I added a row of Glitter Flowers peel-offs on the eyebrows for the other tag, some Glitter Dots peel-offs to her headdress, and used a trio of colored pencils on the eyelids on the card. Instead of drawing spiral curls in a dark color, I used peach so they are a subtle element instead of a bold addition. Note that the torn edges around the quote and the words on one of the tags are colored with the same trio of colored pencils (teal on two sides, peach on the third side, raspberry on the fourth). 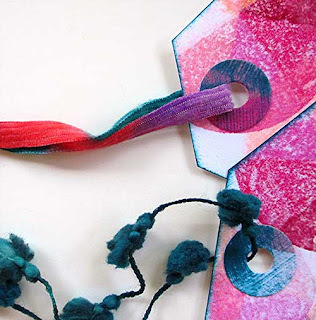 Layer the elements onto tags made from stamped or purchased patterned cardstock or onto a side-fold 6” square solid color card base. *Design Strategy: To further unify the colors and incorporate another handmade touch, distress the edges of some of the layers and the edges of the tags with dark teal (shown: Stream). 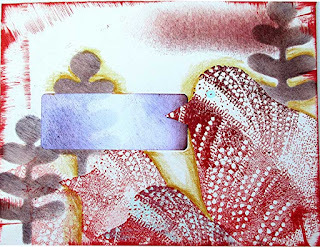 Use a sponge dauber to add the ink or simply pull the edges of the cardstock across the inkpad. Beginners, practice with scrap cardstock till you get the hang of it. Embellish and accent the card and tags. I used Glitter Flowers and Glitter Dots (peel-offs), scallop punched circles (cheeks and base of crown), feathers (crown), and washi tape. *Design Strategy: Transparent Glitter Flowers and Glitter Dots allow the colors below to show through! (I love ‘em!) 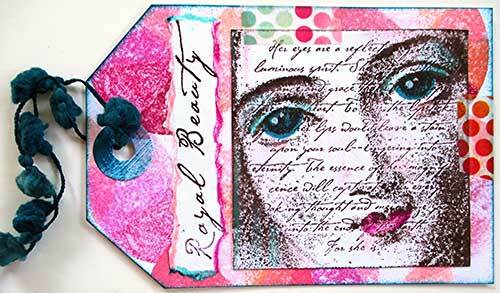 Trace the cheek line at the left side of the stamped face onto lightweight paper and use it as a template for cutting the scallop punched circles. This ensures that the curve will match the stamped image when glued in place. Reinforce the holes on the tags with a contrasting circle. Add fibers. *Design Strategy: I used a reinforcement die from a ‘Tags & More’ die set, but you can punch a 5/8” circle with a 1 /4” circle in the center if you don’t have the die. I saved the small center circles and used them as an accent at the bottom right corner on the card! (Did you notice them? 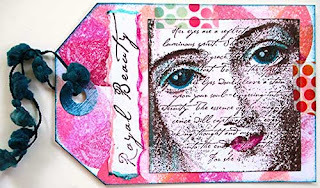 A Royal Welcome - Judi Kauffman Joins The Queen’s Ink Blog! We did it! 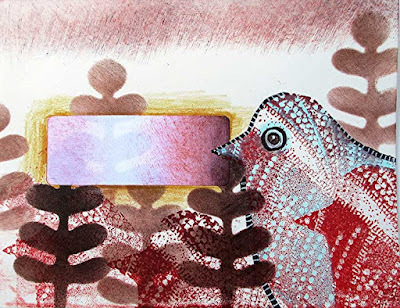 We lured Judi Kauffman out of retirement to teach classes for The Queen’s Ink, and now we’ve enticed her to post on our blog several times a month. Judi is endlessly inventive, and we’re so excited to have her as part of the team. She has been my friend since the day we met, and a designer, writer, teacher, and product developer within the craft industry for a long time. She carved her first linoleum block while she was still in grade school, later went on to earn a BFA in printmaking and an MFA in fibers. These days she spends endless hours doing what she calls ‘creative puttering’…I could live happily ever after in her studio where we have frequent play days. We look forward to your comments and hope you’ll invite your friends to subscribe to the blog. If you have a project in mind that you’d like to see, Judi’s happy to put your requests into the lineup. Please join me in giving Judi a royal Queen’s Ink ‘WELCOME’!